On air promos are key for broadcasters to create an audience pull. To generate maximum curiosity and interest in audiences with varied profiles, promos are often placed across different time bands and cross promoted within the entire channel network. Typically, the marketing department, as part of creating ‘promos’, crafts multiple campaigns to promote the network’s shows. Each of these campaigns has multiple creative which are then handed over to the Promo department for creation. Typically, Promo Operations creates work orders – (1) for each promo campaign, (2) for creative under each campaign, and (3) for multiple versions of each creative. Currently, this entire process is performed manually from work order administration to version creation. Imagine this – let’s assume a channel plays out 150 (X) promos a month per feed. The creation of these promos involves combination of as many as 750 (5X) AV elements. The editors and Promo Operations staff manually coordinate and track availability and creation of each of these 750 elements, then complete another 150 manual transactions per feed to make these promos transmission (Tx) ready. These manual orchestrations are tracked through spreadsheets and emails. For broadcasters who play-out hundreds of promos a day, one can only imagine the chaos as well as the massive costs incurred on account of both manpower as well as infrastructure. Needless to mention the chances of human error. The picture below depicts the typical process flow for developing a creative and versioning it based on a promo brief. 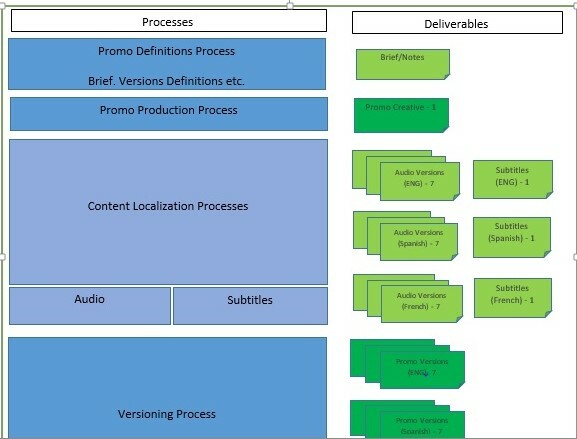 Alongside this process depiction, are the media deliverables that are produced at each step. The numbers provided are the indicative deliverables produced against a single creative. The Promo Definition phase involves putting together the brief for the campaign, according to which a bunch of creatives are developed. Marketing and Promo Producers work closely to define the briefing, versioning strategy and the key schedule dates for each creative. Once these key aspects are defined, Operations teams take the definitions forward. Promo Production involves content creation, review and finalization of creatives. Generally, Promo Producers, Editors and Graphic Artists work closely to produce the deliverables. The approved creative is then taken ahead for Localization and Versioning processes. Localization involves processes like Dubbing, Subtitling, Closed Captioning and Audio Description, which enable promos to be delivered in different languages and feeds based on the broadcaster’s requirements. 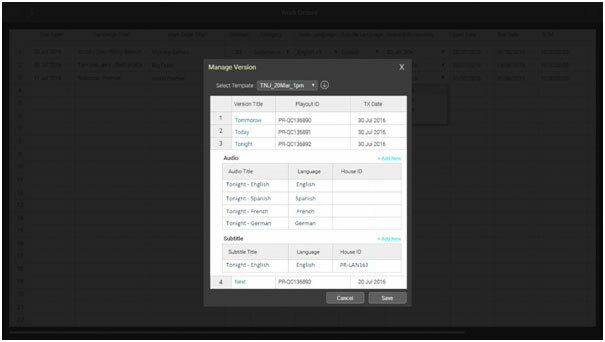 Localization is very closely linked to the Versioning process, as most versions also require voice overs to be developed in different languages based on the version brief. Multiple video source elements like Begin-board/End-board etc. Multiple regions within a source like Mid-strap, End-strap etc. Multiple text layers with movie/show name, date/timing and other disclaimers like ‘Premiere’, ‘New Release’ etc. 1. In terms of numbers and volumetrics, the table below gives an indication of the amount of media involved over a given week across one television channel. This does not take graphic elements into account. The figures amount to approximately 4 x 3000 = 12,000 media files every month, assuming no rejections or re-work. 2. Definitions of Promos are generally made in scheduling systems. These definitions are then exported into Excel sheets to generate a make list for a week. This make list is constantly updated with real time information manually. 3. Given that most of the operations involving Localization are outsourced, it becomes a nightmare to manage and track Media Logistics and the Operations across multiple organizations. The situation only gets more complex in case the need to re-ingest arises due to rejection during the QC (Quality Check) stage. 4. There is no mechanism to orchestrate and deploy the workflow. 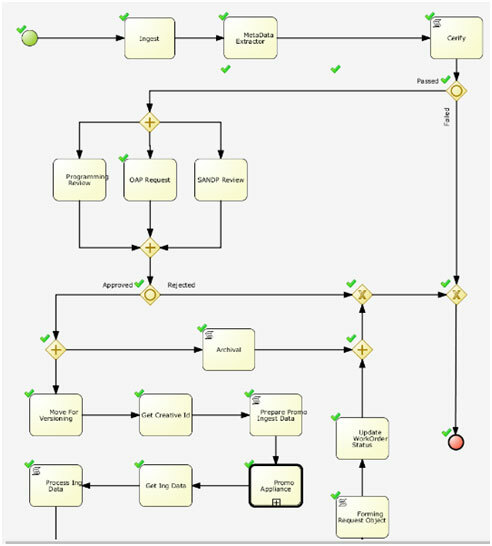 The workflow is driven based on knowledge of specific people who use utilities like FTP/Aspera/Diva etc. to perform point operations. There is no operational dashboard to confirm the delivery status of files for Transmission or for tracking the status of tasks like Archiving. 4)	Task Lists for everyone to perform tasks like upload, download and review/approve. These can be for external vendors, internal promo teams, QC teams etc. 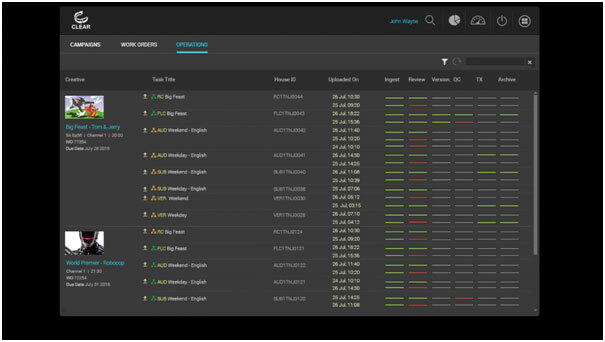 Promo Operations, a module of CLEAR™ Broadcast Cloud, addresses the above challenges by providing real time dashboards to Operations teams. These dashboards are driven by the underlying distributed workflows deployed in CLEAR’s workflow engine. Given below are a few screen shots that indicate what users experience when they login to CLEAR. The Excel style grid below is used by Promo teams to create work orders for developing promos based on the briefs provided by Marketing teams. Each row below indicates a ‘Creative’ that will go through its complete lifecycle, from Concept → Rough Cuts → Final Cuts → Dubbing → Versioning. Every creative has a due date against which all tasks are tracked within CLEAR. Additionally, as part of the work order definition, language information is identified for ‘Dubbing’ and ‘Subtitling’ tasks. The ‘Select/Edit Versions’ lists all the ‘Versioning Templates’ that have been configured in the system. A versioning template defines the different ‘Promo Versions’ that need to be created for a particular creative. 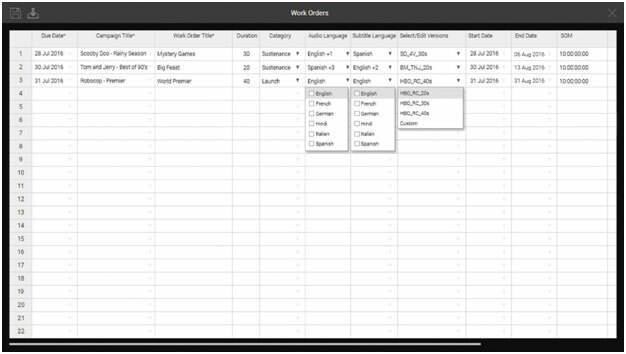 Based on the chosen template and the languages selected in the step above, the version configuration is generated and presented to the user for review. Each row in this pop-up indicates a work order, either for internal promo teams or external vendors. The user provides House IDs wherever relevant. The House IDs listed against the audio and subtitling elements of a version indicate sidecar deliveries to destinations. 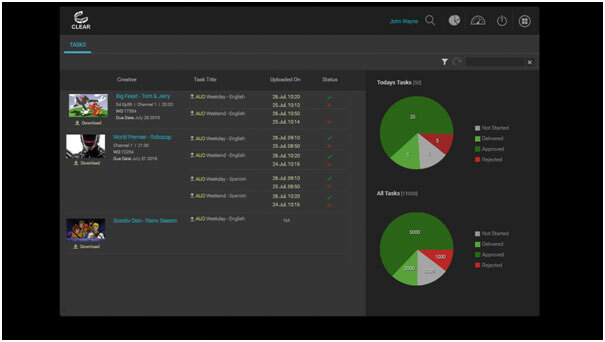 The operations dashboard is where Promo Operations teams track every incoming inventory item across their lifecycle. This could be for rough cuts, final cuts, subtitles, audio etc. The dashboard is sorted based on due dates and filtered by unfullfilled work orders. Uploaded icons allow users to select a work order and perform a file- based upload. Once a creative is approved, vendors get to see their relevant tasks against the approved creative. They can download the reference file of the creative, and perform uploads of their deliverables. In certain cases, the work orders may be involve delivery in multiple languages in one .wav file. In other cases, these may be seperate work orders resulting in separate .wav file deliverables. Once the audio files are uploaded, Promo teams can review them against the creative proxy on CLEAR. Once vendors upload the audio files, they become available for review. Once all files have been uploaded by vendors and approved by the Promo teams, automation kicks in to generate work orders for ingesting the Promo Versions into CLEAR. 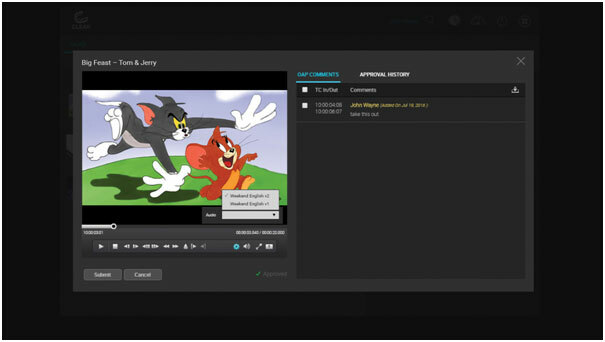 Version editors are expected to view their Task Lists and upload the promo versions that have been created against the specific creative. Additionally, the approved creative with essences from all the different vendors are archived into the tape library for future use. At any given point, Promo Operations teams can drill down into the orchestrated workflow to review in near real time, the progress (% completions) / exact failed steps etc. Launched at NAB 2016, PFT’s Promo Operations Module has already successfully delivered 20,000 promos in 2 months for one of India’s leading broadcasters, with PoC (Proof of Concept) for five top US broadcasters underway.